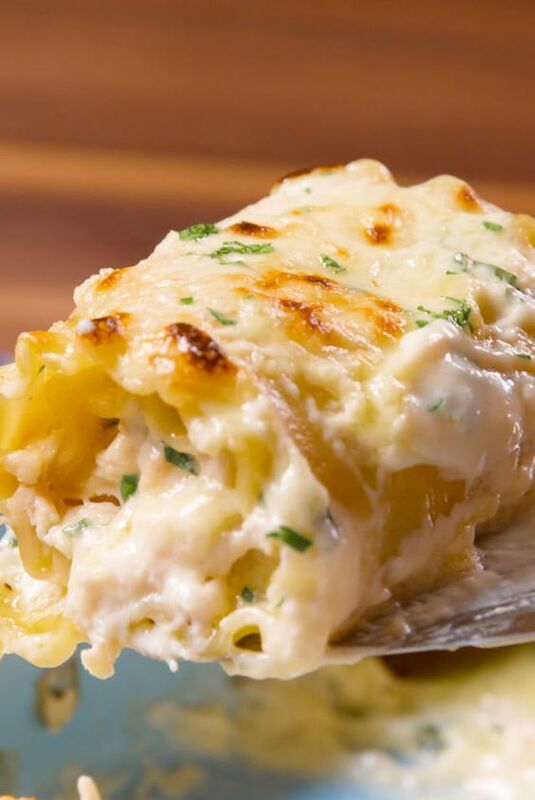 Chicken alfredo roll-ups are a dreamy, creamy weeknight dinner masterpiece. Preheat oven to 350°. In large skillet over medium heat, melt butter. Add garlic and cook until fragrant, 1 minute. Whisk in flour and cook until mixture is bubbling and golden, 1 minute more. Gradually pour in milk, whisking constantly. Bring mixture to a simmer, then stir in cream cheese and Parmesan. Let simmer until sauce thickens, 2 to 3 minutes. Add lemon juice and parsley and season with salt and pepper. Spoon a thin layer of sauce onto bottom of a large baking dish. Lay cooked noodles in a single layer on a cutting board or baking sheet. Spread alfredo mixture on each noodle, top with shredded chicken, and roll up. Lay roll-ups seam side-down in baking dish. Spoon remaining sauce on top of roll-ups. Bake until sauce is bubbly and golden, 20 minutes. 0 Response to "Chicken Alfredo Roll-Ups"